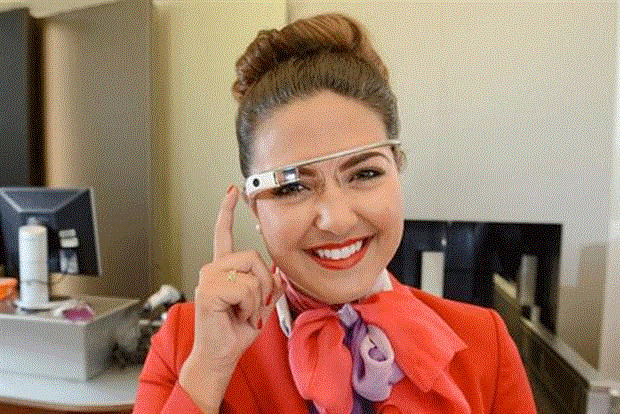 Virgin Atlantic extends its wearable-tech trial. Virgin Atlantic staff will use Google Glass headsets and mini printers to scan passengers' passports and print boarding passes in a bid to reduce check-in times. The airline is set to extend its wearable-tech trial, in which Virgin Atlantic staff wore the smartglasses and Sony smartwatches to greet passengers and supply tailored information ahead of their flight. The initial trial involved only first-class passengers. Now Virgin Atlantic wants to bring wearable tech to general check-in areas to improve the customer experience. "We are going to start with Google Glass, but we are trialling a number of different glasses," David Bulman, chief information officer, told Marketing. "We’re trialling apps that allow (staff) to take a picture of your passport, which then works with our systems to find your booking and other information," Bulman said. "We have done trials with printers that sit on people’s belts, so that we can print off boarding passes." Virgin Atlantic is still firming up the details and has yet to decide where the trial will take place and how long it will run. Virgin Atlantic is also testing wearable tech within its own operations, Bulman said, such as smartwatches for ground staff and Oculus Rift headsets. Virtual reality could be a cheaper, more convenient way to train up cabin crew, for example. "We’re doing some playing around in the training arena for familiarizing crew with aircraft," Bulman said. "Is there something there? I think there is, but it’s not quite mature enough yet. But creating virtual environments to train your crew is going to be one of the next innovations." Elsewhere, Virgin Atlantic is examining the use of wearables for "back-office functions," including technology for workers responsible for ensuring a plane takes off on time. "We’re looking at smartwatches because you can get more rugged versions," Bulman said. "I haven’t seen a good smartglass product that can deal with harsh environments. (These staff) need small tickets of information, such as the refuelling truck has arrived, or that the pilot is in the cabin. "They need blips of information that we can automate." Bulman pointed to Virgin Atlantic's industry firsts elsewhere, such as the installation of flat beds in business class and on-demand entertainment. "There are a number of things we’ve brought to market first and that’s a position we feel very strongly about," he said. "We want to be driving change within the industry. That’s very Branson," referring to Virgin Atlantic founder Richard Branson. This story first appeared on marketingmagazine.co.uk.